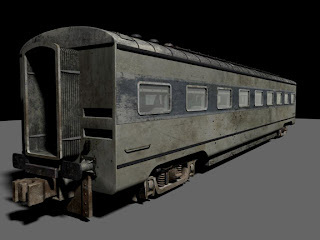 In texturing the 3D models of the train, I tried to accomplish this: I wanted the textures to look real, but not so real that they would move away from the painted look of the From Inside graphic novel. My sources for real metal included dirty, stained, aluminum cooking utensils or kitchen appliances. Cookie sheets, toasters, cappuccino machines, bread makers, coffee pots. Most used cooking supplies - even ones that are still in commission - have amazing scratches, dents, stains and colors. Especially aluminum pans that have been washed with harsh detergents. I also dug through scrap yards for sheets of rusted metal... Car parts, truck parts, an old metal cash box (Empty. Unfortunately). 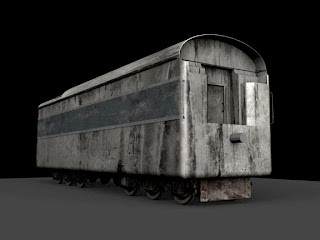 I also dug up a few actual train parts. In most cases these pieces of metal were placed directly on a large format scanner and scanned at a high resolution. Some of the odd-shaped pieces were photographed. Next: Painted textures. Oil, Acrylic, Ink... anything and everything. Some of these textures were made in a calculated way - with intentional shading, brush marks, and color changes.... some of them are palettes that I liked the messy, random look of... and some of them are scans of original paintings from the From Inside graphic novel. The image below shows some of the textures which are the result of combining the paint and the metal. Again: I've tried to make them look like real metal, but at the same time have a painted, hand-made feel. 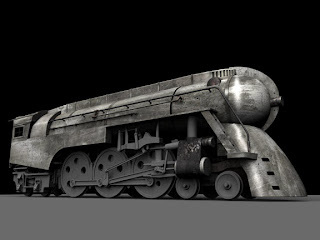 Here are some shots of the 3D texturing when it was in-progress. My favorite parts of the textures are the ink splatters you can see here and there.